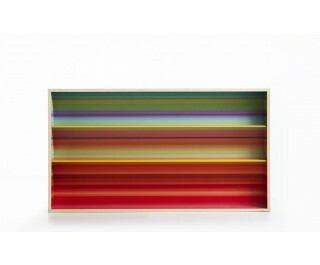 Color Fall, designed by Garth Roberts for Casamania, is mensola a parete e libreria wall (bracket and bookcase) which, in its essential form, packs the power of color. The series is composed of a framed wall and a unit to floor. In all formats, the dinamic nature of the color and the balanced proportion of the shelves make the elements delicate decorative signs. It is the set of endless colored lines, that in a cascade way, fill volumes and immediately convey the energy of the color.